Federated Republican Women's Club to meet Thursday, April 24th. There is no Central Committee meeting scheduled in April. Watch for May meeting information TBD. The Federated Republican Women's Club of Lafayette County, Mo. will meet Thursday, April 24th at 7 p.m. at historic Lafayette Hall at the corner of 10th and Franklin in downtown Lexington. Built in 1905 as the Lexington City Hall, the building has a floating dome that was used for civil defense watches during World War II. 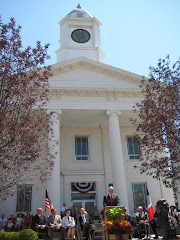 The historic structure has been restored and now houses several of Lafayette County court offices as well as Division 2 and Division 3 court rooms. It is open to the public. Program topic and speaker: to be announced. For more information, contact Lana Crain, president, at lanacrain@yahoo.com.